Sure you want to save gas, but there's a lot of bad advice on how to do it. Some of it makes no difference, and some of it can wind up costing you. 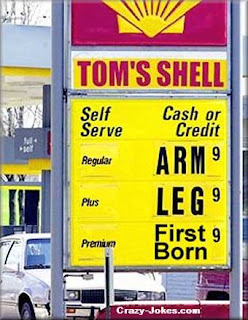 With gasoline prices hitting record levels, it seems everyone has a tip on how to save fuel. Much of the advice is well-intentioned, but in the end, much of it won't lower your gas bill. You may have heard that it's best to fill your gas tank in the early morning while the fuel is cold. The theory goes that fluids are more dense at lower temperatures, so a gallon of cold gas actually has more gas molecules than a gallon of warmer gas. But the temperature of the gasoline as it comes out of the nozzle varies little during the course of the day, according to Consumer Reports, so there's little, if any, benefit, to getting up early to pump gas. While engine power will decrease slightly as the air filter becomes clogged, a lack of performance or an increase in fuel consumption will be negligible, Consumer Reports says. With prices already over $4.00 a gallon, premium gasoline is a hard sell these days. But a lot of drivers think because their owners' manual recommends premium, they'll get better fuel economy if they stick with it. Really, they're paying more money for nothing. Even cars for which premium is recommended won't suffer with regular fuel. Modern engine technology comes to the rescue again. When sensors detect regular instead of premium fuel, the system automatically adjusts spark plug timing. The result is a slight reduction in peak horsepower - really, you'll never notice - but no reduction in fuel economy. Proper tire inflation is important for a number of reasons. Under-inflated tires are bad for handling and can even cause a crash. Improper tire inflation also causes tires to wear out faster and to heat up more, which could trigger a dangerous high-speed blow-out. According to on-the-road driving tests by both Consumer Reports and auto information site Edmunds.com, underinflated tires reduce fuel economy, so proper inflation is key. But you should never over-inflate your tires. They'll get you slightly better fuel economy because there will be less tread touching the road, reducing friction. But that means less grip for braking and turning. The added risk of a crash isn't worth the extra mile a gallon you might gain. There's no question air-conditioning makes extra work for the engine, increasing fuel use. But car air conditioners are much more efficient today than they used to be. In around-town driving, using the A/C will drop fuel economy by about a mile a gallon. At most speeds and in most vehicles, A/C use drains slightly more fuel than driving with the windows down, contends David Champion, head of auto testing for Consumer Reports. "My final take on is that it's very close," says Phil Reed, consumer advice editor for Edmunds.com. "It's hard to measure the difference and every vehicle is different." The best choice - if temperature and humidity allow - is to keep the windows rolled up and to turn the A/C compressor off. You can keep the fans running to blow in air from the outside, but your car will be as aerodynamic as possible while still letting you breathe. You will save gas, but the fuel economy improvement will be slight. Before you buy a device that's supposed to make your car more fuel-efficient or pour in an allegedly gas-saving additive, ask yourself this: Don't you think oil and car companies aren't doing everything they can to beat their competitors? If BP (BP) could add something to its gasoline that made cars go farther on a gallon, cars would be lining up at the company's pumps. Sure, people would burn their fuel-saving BP gas more slowly, but then they'd drive right past rivals' gas stations to come back to BP for more. BP stations could even charge more for their gas and still sell tons of the stuff. So if there really was an additive that made gas burn up more slowly, it wouldn't be sold over the Internet one bottle at a time. Likewise, car companies are already spending big bucks to increase fuel mileage. If General Motors could make its cars go significantly farther on a gallon simply by putting a device into the fuel line, don't think for a second it wouldn't be doing that. GM's car sales would go through the roof. But drivers who try them will swear they work. In reality, it's probably an automotive placebo effect, says Reed. Buy one of these devices or additives, and you're like to pay extreme attention to your fuel economy and how you drive. Of course it can't hurt to keep a close eye on your driving habits -- and what kind of car you drive. In the end, that can make the most difference in saving gas.